It’s our company's goal to be your go-to service for garage door problems. Thanks to the skills of our expert technicians, we can handle any job, from a malfunctioning opener to a set of broken springs. We provide emergency repair service, too, so if you need help to arrive quickly, you can count on our team at Garage Door Repair Kissimmee. There are lots of different issues that your automatic opener can develop, such as the failure of the motor gear. When this happens it can be very inconvenient, often making it hard or even impossible to get in and out of your garage - hardly what you need first thing in the morning. Not to mention, problems with the motor unit can also be quite dangerous. Our experts will quickly troubleshoot the issue, and apply the appropriate solution for it. Another common issue that our customers encounter is a door that gets stuck or becomes separated from its tracks. This can occur due to a variety of reasons, such as dents in the tracks or a build-up of dirt and grease. 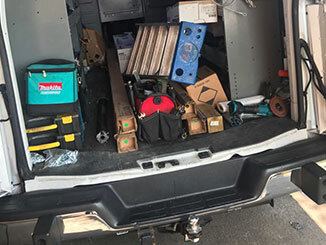 Whatever the cause, our technicians will be able to secure the door back into its proper place, and will identify the root cause of the problem. This might mean cleaning the tracks, repairing minor damages or even replacing them; either way, we’ll make sure the problem gets solved quickly and safely. The cables that support your garage door's weight are integral parts of the system. They can weaken over time, and it’s essential to catch any signs of fraying before these components break completely. The condition of these units is often checked during other work, such as spring replacement and adjustment, but you should integrate this inspection into your regular maintenance routine. Timely cable replacement will prevent potentially dangerous accidents, so the handful of seconds it'll take you to check these components will be well worth the effort. These are just a few of the comprehensive garage door repair services that our team offers. No matter what type of problem you’re experiencing, you can count on our experts to find an effective and affordable solution for it. Call us today.